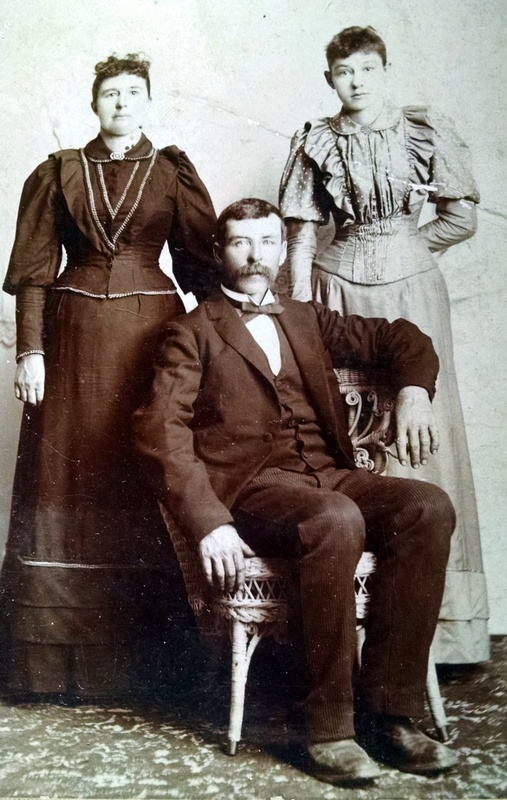 I was recently contacted by a descendent of James Henry VanHook (1838-1906) and Zerelda Ashcraft (1837-1910) who kindly shared this photo of James and Zerelda (with one of their younger daughters) taken in Cynthiana, Kentucky (probably in the 1890’s). I’ve long known about this man and his descendants in the Harrison County, Kentucky area – but I never knew who his parents were. This photo, and the personal contact from his descendants, made me want to do a little research on him to see if I could place him in the broader VanHook family tree. From his burial record in Battle Grove Cemetery in Cynthiana, we find his birth date of 1838. Interestingly, the record also mentions he was a veteran of the Civil War – on the Confederate side. In both the 1880 and 1900 United States census, his birthplace is given as “Indiana” – and his birth date in the 1900 census is shown as May 1838. I’ve been unable to locate him in the 1850, 1860 or 1870 census. In checking the 1840 US census for Boone County, Indiana, we find one VanHook family there – that of Elkanah VanHook. And the family shows a single son – under 5 years old – the right age to be James. Elkanah was one of 11 children of the famous Archelaus VanHook and Jemimah Whaley – early settlers of Harrison County, KY. Elkanah married a Nancy Ann Blair on 10 Jan 1832 in Harrison County, then relocated to Boone County, Indiana in 1835. That county was being subdivided and settled at the time, and was attracting people interested in cheap land (somewhat on the frontier). Elkanah moved there (to Lebanon, IN), and stayed in the area for more than 10 years. From that 1840 census, we know the family had 3 daughters and a son. It is believed Nancy Ann Blair, Elkanah’s wife, died in the 1840’s and we know Elkanah ended up in Cincinnati where he died in 1849. This information comes from a biographical narrative of their oldest daughter Sarah Elwyn VanHook (see the notes section on this link). The names and fate of the other 2 daughters is unknown. It’s always wonderful to make another family connection – both personally as well as tying the lines together. Regarding James’ Civil War activity for the Confederacy – he was a corporal in Company A of the 1st Battalion Kentucky Mounted Rifles. This group was mustered in Prestonburg, KY and fought from 1861 to 1863 in Eastern Kentucky and Tennessee. Being a border state, Kentucky contributed soldiers to both sides of that war. Posted in Uncategorized. Tagged with Civil War, Kentucky, VanHook. Lyman Copeland Draper was a nineteenth century historian who traveled extensively and interviewed many of the people involved in the settlement of the trans-Appalachian “west” of the late 1700’s. His work remains today in almost 500 volumes of interviews, transcripts, etc. at the Wisconsin Historical Society. In “Series S” of those notes, volume 3, is found a very interesting interview with a Mr. Ellison E. Williams. Ellison Williams was born in Surry County, North Carolina on 19 April 1770 (more commonly his birth year is given as 1766, but in the interview with Lyman Draper, Williams states he was born in 1770). As a young boy, in October of 1779, he traveled to Kentucky with his father and mother – Peter and Margaret Williams. Ellison’s father, Peter Williams, died in August of 1783 (probably killed by Indians). About a year later, Samuel VanHook (1733-abt 1809) returned from captivity by the British and married the widow, Margaret Williams. The young Ellison Williams then had a new step-father. Ellison Williams then went on to have quite a colorful military career – primarily as a spy. He became a friend and companion to Daniel Boone – and served as a pallbearer at Boone’s funeral. Williams died 11 August 1850 in Kenton County, Kentucky. The Draper interview is very interesting and paints a detailed picture of life on the frontier in Kentucky in the 1780’s. Click here to read a transcription of that interview. I would like to thank Harry Enoch for uncovering this critically important document. Posted in Uncategorized. Tagged with Kentucky, VanHook. This past week my son and I traveled to Kentucky to visit my Mom. On this trip we did a bit of record hunting in some central Kentucky courthouses (a few bits found – but nothing groundbreaking). 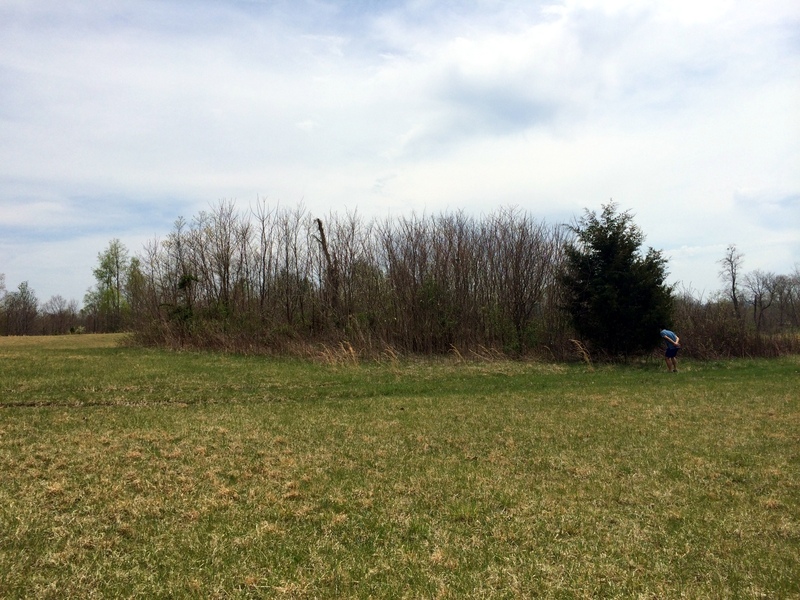 On Monday, April 21st we were in Danville, KY and decided to try to locate Benjamin VanHook’s (1768-1854) grave near Brodhead, KY. I was at this site over 30 years ago after it was initially located (by Charlie and Willard Hilton), and when the large monument was placed there by VanHook descendants in 1981. Here is the location of the cemetery on Google Maps. 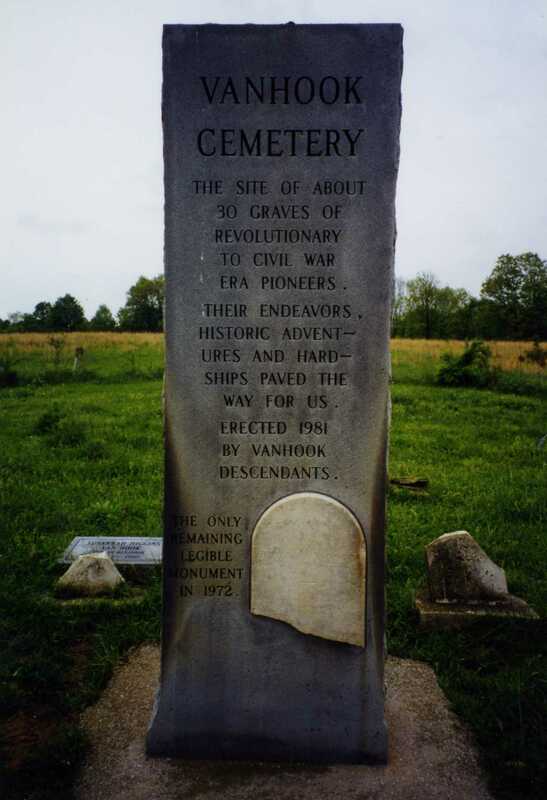 The graves at this site are located on what once was a 100 acre farm in Rockcastle County, KY that was purchased in September of 1833 by Benjamin VanHook and his wife Susannah from John Chance. Their son, Henry Thomas VanHook, owned land adjoining it. Benjamin and Susannah were both buried here after they died – along with other unnamed family members ( it was probably in use as a cemetery before they bought the farm). After they died, the land passed to their children, the legal heirs, who transferred the property to James Harvey VanHook, one of the youngest sons, in 1865. He immediately sold the land to Morris J. Harris the next month. George and James Hopkins (their sons) in 1917. George Hopkins transferred about 150 acres of this land to his first wife Lula in 1936. George and Lula were divorced in 1944 and he then sued to get the land back. There were so many children involved that a defect in the title was introduced during t his period. Eventually the title was cleared up and the land passed to Elihu Saylor in 1946, the husband of Retha Hopkins (George’s daughter and son-in-law), and then to Tony Saylor. Tony Saylor died intestate in 1947 leaving a widow, Delia Saylor, and 5 children. They sold the 150 acres to D.A. and Vivian Robbins in 1966. In September of 1980 D.A. 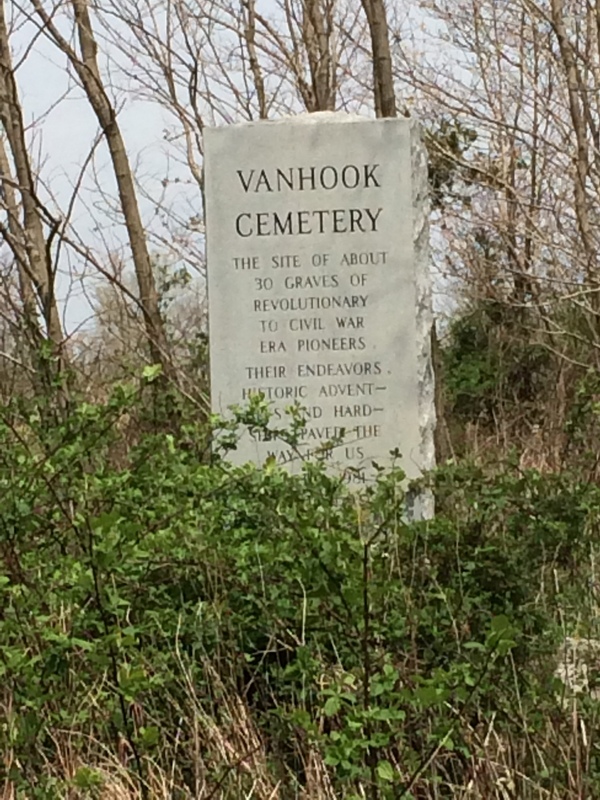 and Vivian Robbins deeded by gift to the VanHook trustees (Larry VanHook, Nancy VanHook Mullins, and Herbert L. VanHook) the land containing the old Benjamin VanHook family cemetery on their property (about 1/2 acre). It was on this site the VanHook descendents erected a monument in 1981. At the time, this was a cow pasture and rubbing by the cows was wearing the new stone – so a chain link fence was erected around the graves. The photo to the right is how the monument appeared in the early 1980’s. The only readable stone at that time was Benjamin’s (embedded now in the monument). A new stone for Susannah was also added (which can be seen on the left). To access the cemetery, we had to park just off the Brodhead-Chestnut Grove Road just as it crosses Bowman Branch creek (the locals call this the “crawdad hole”). The gate there was locked as someone is farming the fields up on the hill and has quite a bit of farm equipment up there. We hopped the gate, and followed the dirt road winding by the creek and climbing the hill – first into a corn field, then through a slight break into a hay pasture. Since the chain link fence was installed years age, no one has been mowing near the gravestones, so a large amount of briars, tree shoots, bushes etc. has grown up around the graves. The fence has been flattened completely (it is still there – just on the ground) – but seeing and getting to the stones takes a bit of bushwhacking. You can see the view of the graveyard and the current view of the monument from the photos. In addition to the additional “Susannah” stone – 2 more were added sometime (probably in the 1980’s also). One is for Henry Thomas VanHook, Benjamin’s youngest son by his first wife Francis. Henry Thomas died in 1847-1849 (the stone says 1849 with the note “killed by a horse”). It is likely Henry Thomas was buried here. Another stone for “Benjamin’s father” has also been added showing “Samuel VanHook 1733-1820.” This stone is probably wishful thinking. It now appears from subsequent research that it is unlikely that Benjamin was the son of the Samuel VanHook who was born in 1733. There is no record of Samuel’s death (in 1820 or other year), and if he did move to Pulaski County with Benjamin in 1808 from Harrison County, KY – and did die in 1820 – he most certainly was not buried here. Benjamin did not own this land until 1833. Unfortunately – there is rampant misinformation on the internet about Samuel (and Benjamin) based on stories, myths, etc. At the “Find a Grave” Web site – even Benjamin’s grave is misplaced! “The Van Hook coat of arms has a long history. 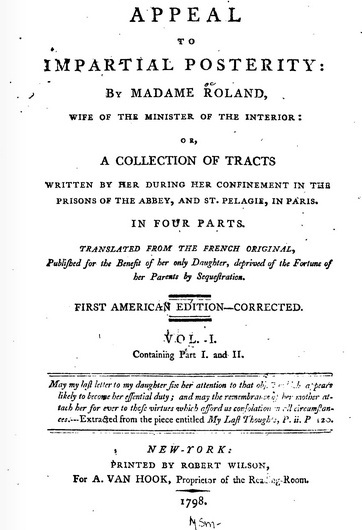 Riestraps (sic) lists the family as “of Courlande, originally of Holland.” Courlande was a local district in Holland. This is where the family obtained the arms which means basically that the family owned land there in 1516. We know from James M. Van Hook of Charleston, Indiana (1899) that the motto was “Te Deus Defendet.” The arms show up again on July 4, 1750 when it was reconfirmed to the Van Hook family. Ten years later a “Coat of Arms” was mentioned in the inventory of Aaron Van Hook (d. 1760 in North Carolina). OK – sounds pretty impressive. But let’s examine this description in the historical context. “Rietstap’s” (not Riestraps) is Johannes Batista Rietstap, a Dutch genealogist and heraldist and best know for publishing his Armorial Général in 1861, containing about 50,000 blazons (formal shorthand for armorial descriptions in French) of the noble families of Europe. In later editions, this grew to almost 130,000 blazons. There is a blazon description in Rietstap’s that matches the Coat of Arms depiction shown above, and it does indicate the family is from “Courlande, originally from Holland.” However, this blazon is for a family named “von Hoeck” – indicating German, rather than Dutch roots. Additionally, Courlande (the French spelling) is not in Holland, but rather refers to the Duchy of Courland, a region in Latvia. It’s hard to see how this is connected to our lineage. The statement “the fa mily owned land there in 1516″ came from an assumptive leap from an old myth that we descended from a “Robert/Isaac van Hoeck, who was mayor of Amsterdam in 1516″. Totally fabricated, and totally untrue – there is no basis for this. In fact, in the Armorial Général, there are blazon descriptions for arms for 2 other “van Hoeck’s”, 2 “van Hoecke’s”, and even a “van Hoeckelum” (partial page from the Armorial shown). Who’s to say that they are not our family? The genealogical material distributed in 1899 by James M. Van Hook is loaded with myth, errors, false assumptions and very little source material. While some “motto” (although most Coats of Arms had no mottoes) may have been “Te Deus Defendet” (a bit of awkward Latin that might mean Defender of God, or alternately, God will Protect You), there is no real way to know. But due to the profuse errors in the 1899 document – it is hard to trust anything from that writing. The arms show up again on July 4, 1750 when it was reconfirmed to the Van Hook family. This appears to be a misinterpretation of the blazon description in the Armorial. There is a note on the blazon that says “(An., 4 julliet 1750.)”. “An.” is an abbreviation of “anobli” (enobled) or “anoblissement” (knighted). This indicates when the Arms were first granted to a “noble” person – it is not a record of “reconfirmation” to anyone. Ten years later a “Coat of Arms” was mentioned in the inventory of Aaron Van Hook (d. 1760 in North Carolina). Ah, this is one point that can be proven! Aaron’s inventory (filed in May 1763) indicates “one Coat of Arms”. There is no description of what this looked like (was it a document? was it a seal? ), and it is not mentioned in his will. Also, notably, no Coat of Arms is shown in his father’s estate (Lawrence Van Hook) in New Jersey in 1724. But this proves Aaron possessed such a thing. OK – the tradition of heraldry operated differently in different countries. For example, in English heraldry the arms were granted to an individual – not a family. It could pass to the oldest son of the arms owner, but that son would have to reapply to use the arms. This was a nice way for the herald authorities to make money. Additionally, the inheritor might alter the arms in some way to make them his own. In other countries – anyone could make up their own Coat of Arms as a personal identification. This was the model in the Netherlands – where they were known as burgher (citizen) arms. From 1581 to 1795, the Dutch Republic existed and there was no monarchy or herald authority to grant or register arms. Everyone, citizens, merchants, towns, etc. just created one. Often the family of the arms creator would then use this creation as their collective Coat of Arms. It’s possible that the immigrant ancestor, Arent Isaaczen van Hoeck, as a citizen of Amsterdam and a master shoemaker, created a Coat of Arms as a form of identification for himself and his trade. It’s also possible that these arms were passed down to his descendants. We don’t know – outside of that item in the inventory of his grandson’s estate. (I don’t know what to make of the “account for the “s” in the Dutch transliteration of the surname” comment. It makes no sense). The real problem we have here is the name “Van Hook”. Arent Isaaczen, for the majority of his life, thought of “Isaaczen” as his surname. The Dutch (and northern Germans) were using patronymic surnames during this period. Indeed, this practice continued in the Netherlands until 1811 when legal and persistent surnames were required. In all known records of Arent in the Netherlands, his name is succeeded by “van Hooksiel”, indicating his place of origin (not his name). 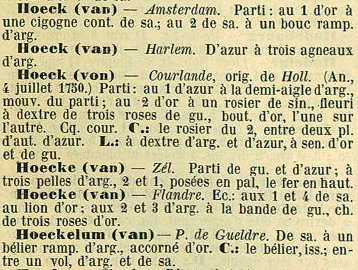 When he immigrated to New Amsterdam in 1655, the van Hooksiel was discarded, and he reverted to his Isaacszen surname. Over the next few years, at least 12 references in the extant record to Arent continued that name model. The place or trade names in New Netherland were common, but sporadically used. Finally, on 7 Jan 1662, the name Arent Isaackx van Hoeck finally appears. The first actual record of the “van Hoeck” name for our family. The vast majority of the records (even after the takeover of New Netherland by the English in 1664) still refer to Arent as Isaacszen (or some variation). There are only 6 other known records where Arent has the “van Hoeck” tacked on the end. After English law took hold in the colonies – the model for standardized and consistent inter-generational surnames was essentially set. So – with the name “van Hoeck” (and later Van Hook) for our family first appearing in the late 1600’s in North America – it’s a far stretch to claim the Armorial record focused on Europe even contains any meaningful information for our family. So, Arent would have given the arms to his son Lawrence Van Hook, of New York and New Jersey. Before he died in 1724, he would have given or willed the arms to his son Aaron. Maybe… but there is no mention of arms in Lawrence’s will or estate. At this point some other family may have disputed the arms forcing each to go to court. The arms were reconfirmed (as previously stated) on July 4, 1750. This is a misinterpretation of a notation in a blazon in Rietstap’s. In 1750, Arent was busy trying to figure out how to safely get out of New Jersey (after losing his farm and being involved in many court cases). Why wouldn’t it pass directly to Aaron’s son Lawrence (1723-1800)? Why to his grandson Lloyd? OK – as we get closer to current times, additional details emerge. Is it possible that the family possessed (through oldest son of oldest son) a copy of the Coat of Arms mentioned in 1763 continuously until its loss in 1934? Of course. 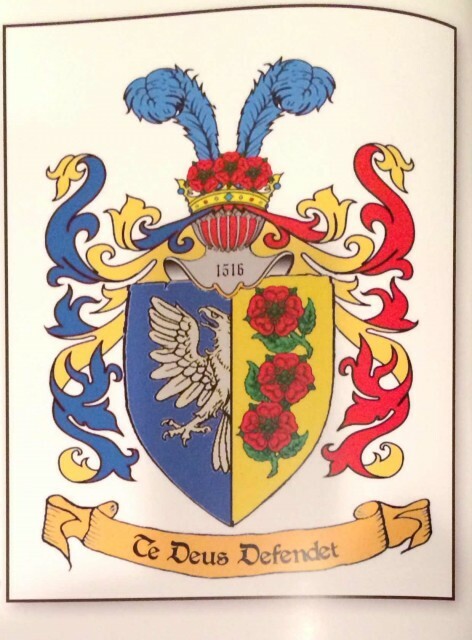 Is it possible that the Coat of Arms matches the one referenced in Rietstap’s Armorial? I highly doubt that. Is it possible that someone in the family in the late 1800’s purchased a “Van Hook” Coat of Arms from a scam artist peddling the description in Rietstap’s? Yes – that’s possible also – much like Coats of Arms are available today on the Internet. Will we ever know for sure? Unlikely – but it is an interesting story! There is nothing to indicate our family hails from “nobility” – but if you want to point to the Coat of Arms and claim it as your own, feel free to. But know that it is probably a harmless form of genealogical myth and entertainment. Posted in Uncategorized. Tagged with Blazons, Coat of Arms, Heraldry, van Hoeck, VanHook.